Do you have a Difficult to Fit Horse? Lolly was born this way, but was successfully fitted and ridden in his ReactorPanel saddle fitted by Dean for many years. What is the difference between ReactorPanel and other panel systems? ReactorPanel® is the most adjustable saddle system on the market. Because the panels and saddle are not permanently fused together they can be attached in a wide variety of ways, the key to saddle fit is to have the panels around the horse, so the benefit of being about to raise or drop the panels or move them back and forwards is advantageous. A small adjustment makes a lot of difference therefore experience in fitting these saddles allows the achievement of the lovely close, connected feeling you achieve with optimum fit.The panels are attached with shock absorbing, Sorbothane discs which absord concussion from the rider above and the horse below allowing for more comfort and freedom of movement.These discs are available in different widths to allow for custom fit and in some cases, such as some warmblood dressage horses who are very “up in front”shimms may also be required to balance the back of the saddle. Why was the RP Saddle System developed and how long has it been around? In the early 1990s Roe Richardson Company Ltd was the only company to invest heavily in computerized pressure testing analysis Computer pressure analysis, first of all to address the shortcomings of conventional and other paneled saddles. In the past much design effort had been aimed at rider comfort , often at the expense of the horse. 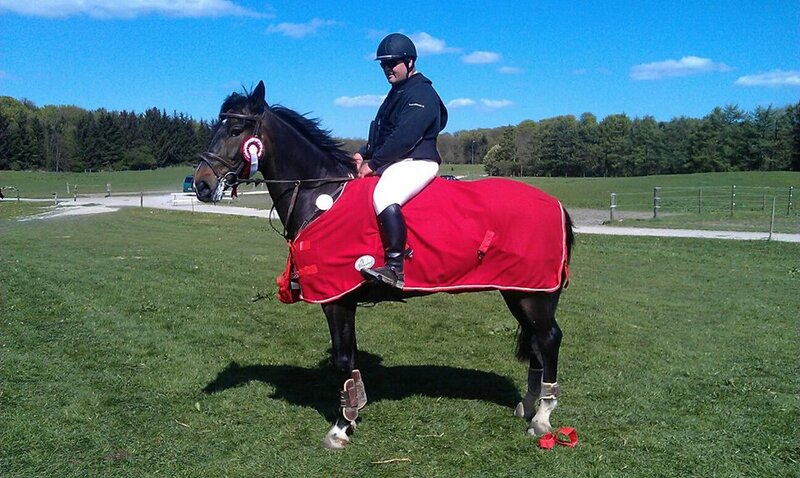 Their aim was to address this imbalance and allow the horse to enhance performance through comfort. The result of this testing and research were the first ReactorPanel® Saddles which were designed here in England in 1991 By Barry Richardson and his son Phil who still works with us today.The product was then Trademarked in 1999. Dean became involved in 2000 and Carmi Weininger also began in the USA around that time. Saddle Exchange then expanded into Europe in 2005. During this time we have made numerous advancements to the products designing and become more innovative with regards to the fitting as we encounter more fitting challenges, we have also introduced new styles of saddle with the input of our customers, accessories such as the weight systems for Endurance FEI riders and the new easy fit numnahs. However the basic design of the product has remained the same, you can’t improve on perfection! How is a ReactorPanel® Saddle different to traditional saddles? Conventional saddles have wool and synthetic flocked, or pre-formed memory foam panels that are sewn pockets attached directly to the tree therefore the shape of the tree has to fit the horse correctly and there is very little room for change. Incorrectly fitting conventional saddles be they too narrow or too wide can damage the horses back. If they are too wide or too narrow pressure is exerted from the points of the tree, if the angle of the tree points is too narrow they will dig in, Tipping the rider backwards and placing the weight at the rear of the saddle. A saddle which is too wide will cause the tree to drop and the panel of the saddle will not support the way it should therefore also giving the effect as if the saddle is too narrow ” the narrow part of the tree at the head of the saddle will sit too low therefore making it feel too tight”, a saddle that is too wide will also twist and move around on the horses back tipping the rider forward. High pressures from too narrow saddles or excessive movement occludes blood flow and can damage tissue and the muscles beneath the saddle also makes movement painful and uncomfortable for the horse making downhill movement uncomfortable and difficult. Body tissues have a self defense mechanism and as pressure is exerted , blood supply is reduced. Traditional saddle designs can typically induce pressures in excess 5 lbs per square inch and also inhibit a horse’s natural movement. The revolutionary design of the ReactorPanel® Saddle drastically improves the distribution of the rider’s weight across the horse’s back to lower harmful pressure under the saddle. It’s built in flexibility maintains this ideal weight distribution , even when the horse is moving. The horse is allowed much more freedom of movement than is possible with a conventional saddle combined with more support for the rider’ weight than a treeless.The flexible panels and Sorbothane discs also cope with the seasonal changes that horses go through meaning that they require less adjustment and maintenance than a traditional saddle, they of course do not bed down in the same way as a flocked saddle which is constantly bedding down and changing, this is especially advantageous in cases of muscle atrophy and horses with high withers as the saddle does not sit in to the damaged area of the horse’s wither pocket, the therapeutic action also promotes the re-generation of wasted muscle tissue. Where and How are ReactorPanel® Saddles Made? All ReactorPanel Saddles® are, and always have been expertly handcrafted using the very finest materials in Walsall, England. Made from the highest quality English leather which is tanned in Walsall around the corner from our workshop . 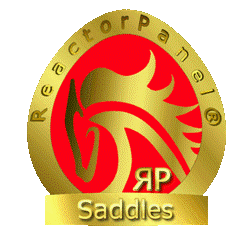 ReactorPanel® Saddles are second to none in look, feel, quality, comfort, and durability. Our panels and discs are also manufactured especially for us using the same original process perfected by Roe Richardson Company Ltd. Everything that goes into the saddle is made in England with the exception of the fittings on our Portuguese saddle and our Western option who’s trees are made in the USA and Denmark. Do the discs cause pressure points? Many people assume that higher pressure exists under the discs. However in a correctly fitted ReactorPanel the panel spreads pressure outward in a horizontal plane, and because there is contact between the bottom of the saddle and the the panels through the middle of the saddle pressure points are eliminated . Computerized pressure analysis bears this out. Sit on you’re ReactorPanel® saddle on a wide saddle stand, put your hands under the front and back of the panels or we can demonstrate if you visit us at a show or event, you will not feel the discs. Dean used to demonstrate in the past by putting the panel on top of someones hand and then applying pressure to the other side with the hand of his hammer to demonstrate that the handle of the hammer could not be felt through the panel, although that demonstration works we don’t like to do that any more !! Will a ReactorPanel Saddle need regular adjustment? If use of the ReactorPanel® saddle is confined to a single, non remedial horse the need for adjustment will be infrequent, however we suggest a check by an Accredited Fitter once a year as changes happen gradually and can therefore be difficult to identify. The ReactorPanel® system automatically compensates for the normal seasonal changes in condition. The saddle will also work on similar shapes of horses with no need for adjustment, during your fitting ask your agent to check the saddle on any horse who will be wearing it. However, if your horse has muscle atrophy, is growing, is undergoing major changes in musculature or condition or is competing at a high level, the saddle may need to fine-tuned more frequently, Our British Team FEI riders for example who compete in 100 mile in 1 day rides have their saddles checked approximately every 2 to 3 months. Our Saddle Exchange Accredited agents will be more than happy to call on you whenever required. Is it easy to tell if the saddle needs to be adjusted? A well adjusted ReatorPanel® feels wonderful to ride in for yourself and your horse, the horse feels relaxed and balanced with a lower head carriage and ease in movement. Although the panels flex with the horse’s movement you should feel balanced and easily be able to maintain the correct position seated on your balance point,feeling very connected to the horse. A very close contact feel is achieved and you can in fact feel ” every footfall “, your horse will also be relaxed and able to maintain balanced movement with less effort . Changes occur gradually and you will feel less balanced and connected and may find that your saddle moves around. This is the time to call us out as ReactorPanel® saddles sometimes need fine tuning and therefore a check by an Saddle Exchange Accredited Fitter is sometimes needed, once the saddle is again fine tuned the original feel can be achieved.Any queries please feel free to contact us directly for advice. Do I need an Accredited Fitter to adjust my saddle? Although the Reactorpanel® system is very straightforward and logical there is a great diversity in the shapes and sizes of our horses , who often have individual needs, their way of going dependent on age, athletic ability and training and we would not recommend fitting your ReactorPanel® saddle yourself unless you are very experienced ( some of our long term customers do adjust their own saddles under direction from us). Riders also have very individual needs and come in all shapes and sizes, hence the choice of seat shapes and sizes, many riders look at pictures of the saddles and decide what they would like often find they buy a different saddle after the fitting as the saddles quite often feel very different to what they expect. Fortunately we are here to help and after years of fitting these saddles have a vast knowledge of what usually works. Our Accredited Fitters attain Accreditation for ReactorPanel go through a long period of training and continual development in the subtleties of saddle fit and are therefore be well equipped to help you. At present all ReactorPanel Fitting in the UK is undertaken by either Dean or Gini.